Dusting off some more Mid-War for this installment of Friday Night Fights. We're back at Brett's place after some lengthy renovations to his home. Moving around keeps from the same person hosting over and over every week. 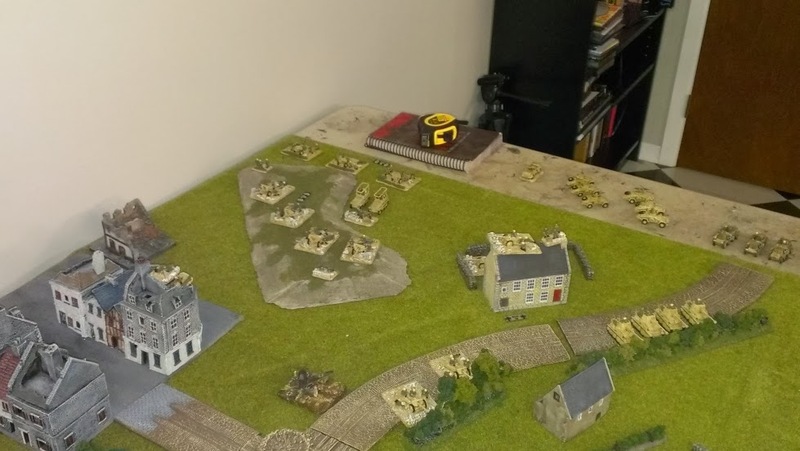 Dennis(MattVarnish) has once again brought his DAK over and we decided to play a game of Dust-Up. It's going to be one of the missions at our tanks only event, 'May Madness' we will be having May 3rd at FdB in Gatineau. The idea was to have an all armored event where there are minimal support platoons containing anything other than tanks. Should be fun and hope you can make it out, or at least read about it once the AAR is done! Deployments for this pretty much gave us each some terrain to use as cover and we ended up with kill zones that were fairly narrow. I blew my deployment plans by fixing in on the center of the table. I forgot enemy teams would be coming in north-east to my position. With the 16" down either side, it meant the Afrika Korps would be right on top of my position early on! I was determined to capture an objective before that could happen. 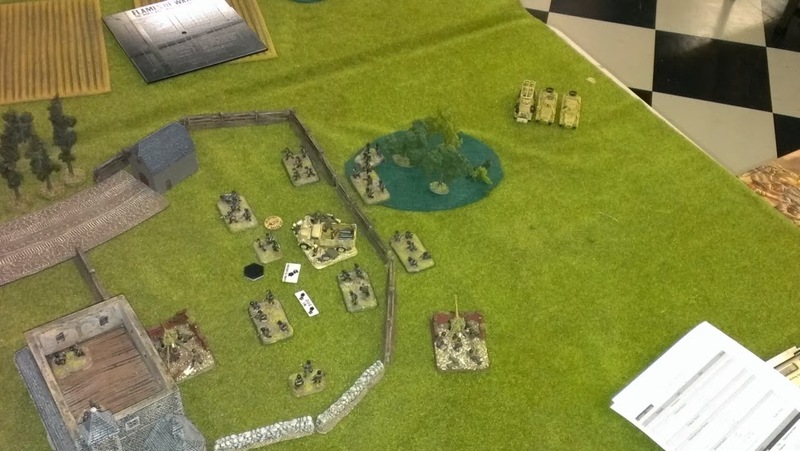 PAK 40's and my Tiger I was guarding the western approach, while Dennis has his artillery and Marders hiding in the center part of the table after turn 1. He was able to dispense of my Flak88 and my PAK 40's early on with good shooting and a lot of rolled 6's! 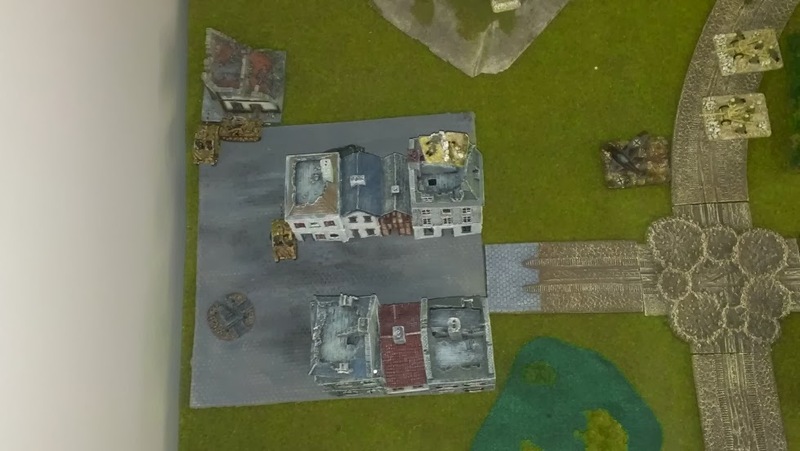 I tried to maneuver my anti-tank assets to take care of the incoming armored cars and relentless bombardments kept me from getting much time to 'dig in' my guns and brace for the assaults that were about to take place! 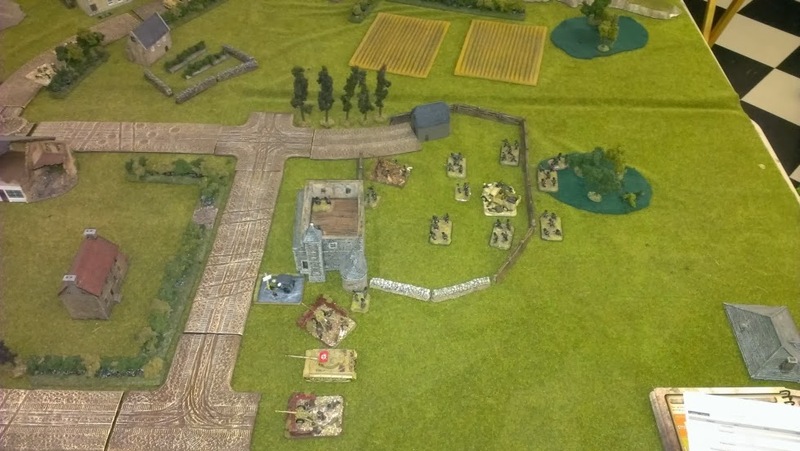 My Marders hit the table and moved into the town, they kept the artillery, anti-tank and forced Dennis to make a decision on whether to bring his own Marders back towards his deployment area to help out his forces. I was able to get the rest of my reserves on and moved them towards that objective you see on the road, just east of the town. 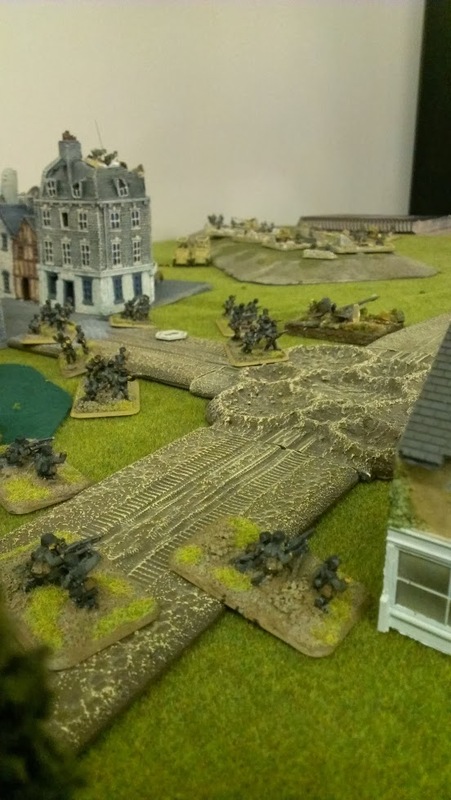 My HMG and Infantry platoons stayed in the open and lay down fire onto two PAK 40 guns, dispensing of them after they had killed off my last Marder and my 7.5cm guns which tried to hold in the town, after a failed 'Stormtrooper' they were easily picked off. 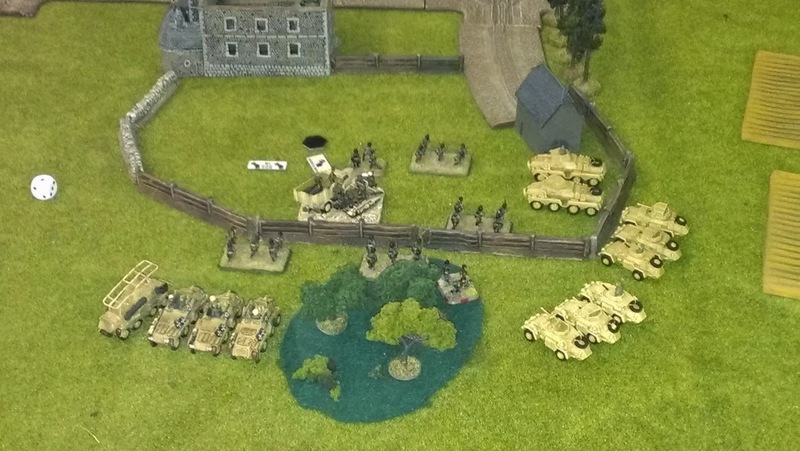 Before I could get over to help the incoming assault and avoid a loss, my Tiger had to sit and take three Marders on by itself for one round of shooting. Fortunately, he was hit once and passed his armor save. 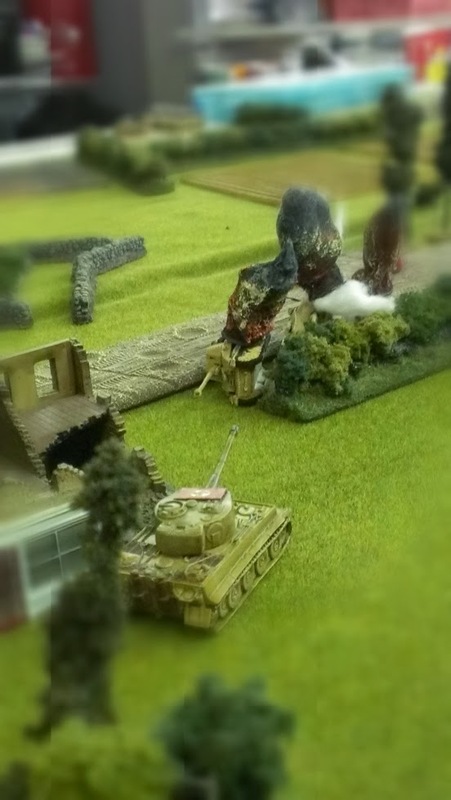 Failing a 'Stormtrooper' of his own, Dennis' Marders were now stuck on the edge of the cover they were using and gave my Tiger with ROF 3 due to Ace Skills easy targets.....boom boom BOOM!! The ammo racks and fuel of the Marders were no match for the Tiger and he managed to kill all three in one volley! The game pretty much came to a close after I was surrounded and could not get my Tiger back quick enough to be effective in repelling the Afrika Korps onslaught! Fortunately I had also landed on top of an objective and with time winding down, made a last ditch effort to go for a draw. It was not to be, I lost the game 4-3 and was a learning experience both for the mission and the forces in my list. To have a Tiger and an eight platoon list, it has it's perks. Whether or not I take the Tiger out and put my Panzer IV platoon back into it, remains to be seen. I recently picked up a German Panther army box 'Feldherrnhalle Panzerkompanie' and a platoon of Panzer IV H's to assemble and paint. Seeing as the next tournament is a Mid-War affair, I will likely have a decent force to table. Just not sure what it's going to be yet, I'm still pissed that the changes to North Africa have seen my Australian's become almost useless. We'll see what I can do in the next month and might even have time to get a hold of some more Shermans to make a Eight Army Heavy Armored Squadron.